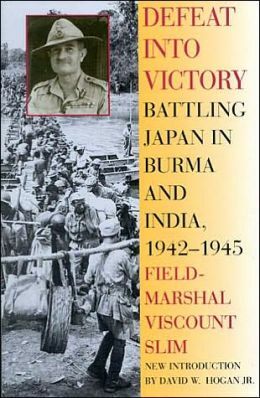 Field Marshal Viscount Slim memoir Defeat into Victory: Battling Japan in Burma and India is generally regarded as one the finest, if not the finest military memoir. Having read it (and not having read many others) I won’t dispute the claim. I often have a hard time with books written by ex-officers, who I find usually bog down in details. I also, to be fair, have a hard time with spatial relations and without solid maps right in front of me I often get lost. Slim’s writing bears some marks of what usually gives me trouble with books like this. What distinguishes this book is his sense of style and humor. He shares many anecdotes that paint himself a bit poorly. He shares honest introspection about his actions without getting too much inside his own head. When he asserts opinions of people he likes or dislikes he admits that others have different opinions. Finally, he seemed interested in the campaign as a whole, more so than his role in it. 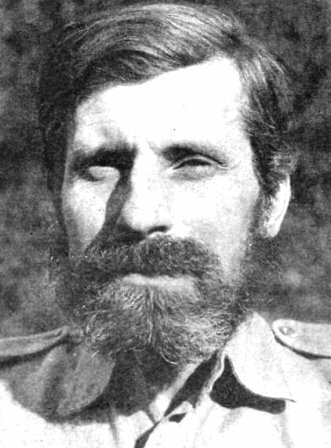 One of his slightly controversial opinions involved Orde Wingate. Wingate was just the sort of commander that would appeal to Churchill. Like Churchill he loved the knight-errant approach to war, and so the Chindits, or special forces, of the Burma campaign, gave Wingate a chance to sally forth boldly behind enemy lines. The direct military effectiveness of his operations seemed limited, though even Slim admits that he boosted morale through the exploits of his men in the aftermath of a complete defeat inflicted by Japan. Yet I came firmly to the conclusion that such [special forces] . . . were wasteful. They did not give, militarily, a worth-while return the resources in men, material, and time they absorbed. To begin with, they were usually formed by attracting the best men from the normal units by better conditions, promises of excitement, and not a little propaganda. . . . The result of these methods was to undoubtedly to lower the quality of the rest of the army, not only by drawing off the cream from it, but by encouraging the idea that certain of the normal operations of war were so difficult that only specially equipped elite corp could undertake them. Anything, whatever short-cuts to victory it may promise, which thus weakens the army spirit is dangerous.
. . . The level of initiative, training, and weapon skill required in a commando is admirable; what is not admirable is that it should be confined to a few small units. Any well-trained infantry battalion should be able to do what any commando can do . . . This cult of special forces is as sensible as to form a Royal Corp of Tree Climbers and say that no soldier who does not wear its green hat with a bunch of oak leaves stuck in it should be allowed to climb a tree. Slim retracts a wee bit of this statement when he acknowledges that certain special units devoted to intelligence and sabotage, which fall outside the duties of standard training for a soldier, but reiterates his main point when he stresses that the multiplication of special forces in Burma made unified command difficult to attain. Our current war on terrorism presents many political and military challenges. We have responded in part by significantly increasing the prominence of our special forces, both in budgets, deployments, and perhaps also in a surrounding “mythos” about them. Like Slim, I am grateful for their courage and dedication. Perhaps unlike him, I am not willing to apply his thoughts wholesale to our current situation just yet. We face different sorts of military challenges now as opposed to W.W. II. But we should not assume that we can do whatever we like militarily without it having consequences on our values and political practices. We should at least ask whether or not the increase of special forces may distance the military from the general public, or whether or not the military will be for “the common man” in the near future. Special Forces demand, among other things, a great deal more secrecy, something else Slim abhorred. Along with drones, they can be used with less public notice and oversight. Democracies do not thrive with a populace disconnected from its government. Is there a parallel between the increase of special forces use and the recent NSA scandals? In other words, a military disconnected from a general democratic population may work (even unconsciously) to undermine the political application of democratic values. Other wars have brought about shifts in our country’s values, sometimes for the better. Maybe this current war will lead us into a better place as well. Whatever the case, we cannot escape some kind of social and political change if we continue to fight in almost exclusively in a clandestine manner, and these changes will likely alter how we practice democracy at home. My grandfather fought with the 101st Airborne Division in Europe during W.W. II, and received a Silver Star for bravery in action. But I remember on more than one occasion him saying that he was grateful he fought in Europe instead of the Pacific/Asian theater. The jungle, he said, might have been too much for him. I couldn’t agree more. Jungle warfare sounds like a nightmare to me. Frank McLynn’s fine book does nothing to dispel my notions. For jungle warfare, how about Burma? — home to large amounts of man-eating crocodiles and tigers. Of the 2500 known species of snakes in the world, only about 200 pose any threat to mankind. But just about all of them can be found in Burma, a country with the largest known concentration of deadly snakes on the planet. True, most of them avoid mankind if they can. Alas, not the small krait, the most feared of all Burmese snakes. Called “The Two Step” (that’s as far as you can walk if bitten before you collapse and die), these snakes had no problem hiding themselves in the dark corners of tents, or in sleeping bags and boots. All this to say nothing of the monsoon rains or the malaria infested mosquitos. Perhaps its our general aversion to the jungle, or our familiarity with Europe, that has led us to overlook the massive war in Burma between 1942-1945, which at various times involved more than 600,000 allied troops. I say to my students that. . . Cultural problems are really religious problems. I am 100% sure that I did not invent this idea, though I can’t place its origin. And while I can’t prove it in every case, it sure sounds good, and I expect that it’s true. 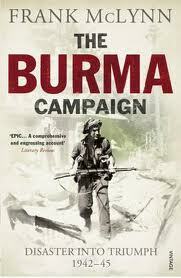 But I do think one can see the above principle work itself out in most cases, including the Burma campaign. For example, Japan had tremendous initial success in Burma as they had all over Southeast Asia in the early days of the war. Their “bushido” mentality helped form a fearsome army that overwhelmed Allied forces initially. But this same mentality led them towards an unrealistic view of themselves and their opponents. Their rigid culture formed a rigid military that did not believe that their opponent could ever learn and adjust their tactics, because after all, they never adjusted their own. 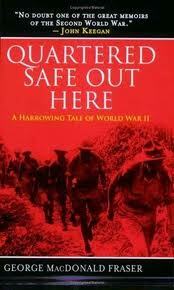 British forces eventually climbed up the learning curve and started to hammer the Japanese by 1944. Yet, the Japanese continue to do the only thing they know how to do — attack. Bushido cares primarily about honor, not victory. Perhaps what the Japanese sought most was not even honor, but an “honorable” death. Their “attaque a outrance” over Asia seemed to court death and destruction. As McLynn notes, by war’s end they had the United Kingdom, the U.S., the Soviets, and China as enemies. Not even the Nazi’s showed such insanity. Perhaps Japan worshipped death most of all, and as C.S. Lewis noted, we must be careful what we wish for, lest we actually receive it. Japanese tactics did not change during the war, no doubt due in part to their rigid culture. But it may also have to do with the fact that they pointed their car to head over the cliff. The Imphal campaign, where the Japanese planned a massive attack knowing that they their troops would lack the necessary supplies to succeed, again illustrates this concept. Thieves respect property. They merely wish the property to become their property, that they may more perfectly respect it. An attitude I think, that reflects the British and Japanese in Burma. The Burmese in the end, could tell the differences between British respecters of property and the Japanese, who sought only destruction. George MacDonald Fraser’s memoir of his time in Burma sheds additional light. Strikingly to me, at least, he hardly mentions the snakes, tigers, and crocodiles, and mostly concentrated on the mosquitos. He respects the Japanese, but certain anecdotes he relates make it clear that the Japanese did not seek military success above “honorable” death. He tells tales of soldiers charging entrenched British positions with nothing more than a sword, yelling maniacally. After Imphal the Japanese were surely beaten, but none of them ever surrendered. Fraser’s account also hints at the coming political transformation of Asia, especially regarding India. Churchill feared using the Indian Army to fight in Burma since he wanted to keep the British empire intact after the war. An army that fought to defend India would inevitably bring home a sense of pride that would translate into independence. Of course the independence movement had begun before the war in India, but the war certainly accelerated it. One Indian soldier, puffed with patriotism, flew too close the sun and insulted a Gurkha while exalting his own Indian people. The gurkha needed a dozen men to prevent him from killing the Indian in reprisal (as a brief aside, what would one not believe about the exploits of Gurkhas? Fraser tells of one Gurkha regiment, who, on a whim, attacked a lost and bewildered Japanese detachment with no guns — only knives — killing all and suffering no casualties themselves). The Brits explained to the gurkha that if he killed the Indian he would be tried for murder and hang. This did nothing to deter him. One of them changed tactics and said that if he killed the Indian he would be thrown out of the army and he would never receive his officer’s commission. That, and that only, did the trick. The gurkha finally backed down after a long and profuse apology from the Indian. Fraser doesn’t talk much about anyone higher than his immediate circle, but McLynn makes a few interesting observations about allied leaders in Burma. Churchill was known for being impetuous, and he tended to like people with just that quality. Just as Churchill’s political career survived numerous missteps and disasters, so too he supported Mountbatten and Windgate (leaders of the special forces in Burma, who specialized in dramatic, but possible ineffective campaigns). All three had enormous self-confidence. Churchill and Mountbatten had both been involved in political/military disasters that should have ended their careers. But luckily for the Allied cause only Windgate may have actually bordered on insanity. The jungle, perhaps, can do that to you. This idea that “standardization is decline” is exactly the sort of pithy phrase that drew the ire of many of Toynbee’s critics. In his work Toynbee attempted to create universal general laws of history based on his premise of the uniformity of human nature. Toynbee’s writing could sometimes degenerate into ideas that seem so general as to be almost meaningless. * On the subject of standardization, we easily see that surely not every instance of standardization brings decline and limits freedom. Standard traffic laws, for example, make driving much easier and much safer. Toynbee’s critics have a point. But some of Toynbee’s critics seem afraid to say anything without caveating it a million different ways, and this too is another form of saying nothing at all. Toynbee’s assertion about standardization is of course is not true in every respect, but is it generally true? I like historians like Toynbee who try and say things, and no one I’ve come across tries to “say things” like Ivan Illich. Toynbee threw down a magnificent challenge to the prevailing view of history (in his day) that more machines, more territory, more democracy, more everything meant progress for civilization. But he did not know Ivan Illich, who allows almost no assumption of the modern world to go unexamined. Toynbee poked at some of our pretty important cows. Illich often aims for the most sacred. In Medical Nemesis he challenges the assumption that people today are healthier than they were in the pre-industrial era. In ABC, he (with co-author Barry Sanders) attacks the idea that universal literacy brings unquestioned benefits to civilization. In fact, he argues the quest for rote literacy will end with meaninglessness and possibly, tyranny. was the first to set out to control the sea, apart from Minos of Knossos and others who might have done so as well. Certainly Polycrates was the first of those whom we call the human race. Herodotus did not deny the existence of Minos, but for him Minos was not a human being in the literal sense. . . . [Herodotus] believed in gods and myths, but excluded him from the domain of events that could be described historically. He did not see it as his job to decipher a core of objective historical fact. He cheerfully [placed] historical truth alongside different kinds of truth. This may seem an odd place to begin a book about language. Later Greek and Roman historians attempted to explain the minotaur and Minos not as myth but as exaggerated historical reality. So, the sacrifice to the minotaur must really have been a sacrifice of perhaps money or troops to some cruel despot. Herodotus will have none of this, and neither will Illich. Those that seek to explain away myths attempt a kind of standardization of truth. This standardization inevitably involves a reduction, a narrowing, of the meaning of truth, language, and human experience. I think this explains why he begins with this quote from Herodotus. In ancient Egypt, scribes with a unified written language could keep records, and could thus hold people accountable to pay taxes, work on the pyramids, etc. In ancient China, too, the power of scribes over language gave them enormous power within the halls of power. Illich argues that medieval oaths used to be distinctly personal. Those that swore would clasp their shoulder, their hands, their thigh, and so on. Towards the end of the Middle Ages, with the rise of Roman, classical concepts of law came the fact that one’s signature stood as the seal of an oath. By “clear” we should think, opaque, or lacking substance because it lacks context. This impersonality can give way to tyranny. Henry II attempt at reforming English law (and thus, it would inevitably seem, unifying language as well) was done to increase his power by making it easier to govern and control the population. Does not much of modern law do the same thing? Isidore of Seville once wrote (ca. 1180) that letters “indicate figures speaking with sounds,” and admitted that until a herald spoke the words, they had no authority, because they had no meaning. The modern age allows those in power to multiply their authority merely through the distribution of lifeless pieces of paper. One of the first advocates for a universal language and literacy, Elio Nebrija, made his argument just after Columbus set sail. He bases his argument on hopes of creating a “unified and sovereign body of such shape and inner cohesion that centuries would not serve to undo it.” He frankly admits that the diversity of tongues presents a real problem for the crown. Regarding Nebrija, Illich makes the thunderous point that he sought a universal language not to increase people’s reading but to limit it. “They waste their time on fancy novels and stories full of lies,” he writes to the king. A universal tongue promulgated from on high would put a stop to that. We might be surprised to note that Queen Isabella (who does not always get good treatment in the history books) rejected Nebrija’s proposal, believing that, “every subject of her many kingdoms was so made by nature that he would reach dominion over his own tongue on his own.” Royal power, by the design of the cosmos, should not reach into local speech. Leave grammar to the scribes. We live in a world of disembodied texts. The text can be analyzed, pored over, dissected in such a way as to kill it. As the texts lack a body, the text remains dead and inert. But just as we assume that meaning comes when a text is analyzed rather than heard, so too we have created the idea of the self merely to analyze the self. Ancient people, up through the medieval period, do not possess a “self” in the modern sense. We see this in their literature. No stratified layers exist in an Odysseus, Aeneas, or Roland. No “self” exists apart from their actions. So too in the modern era the self lacks meaning unless the self is examined. So we turn ourselves inside out just as turn over the texts that transmit meaning. But who is more alive, Roland, Aeneas, and Alexander Nevsky, or the man on the psychologists couch? So the passion for universal literacy ends in the death of meaning, and the death of the self. In his final chapter Illich examines the newspeak of 1984 and sees it as the logical conclusion of universal literacy. Words will mean what the standard-bearers of words say they mean, and this in turn will define the nature of truth and experience itself. ABC is a short book and easy to read. But in another way, reading Illich can be very demanding. He asks you not just to rethink everything, but to actually give up most everything you thought you knew. Agree or not, this makes him an important writer for our standardized and bureaucratic age. *Obviously this post is not about Toynbee, but as much as I admire him and as much as I have learned from him, Toynbee’s latent and terribly damaging gnosticism (which comes from his failure to understand the Incarnation and the Resurrection) did at times lead him into a kind of a airy vagueness that greatly limits his persuasive power. **I suppose to get Illich’s full argument on this score we would need to read his Deschooling Society. This week we tried to understand why England and other nations allowed Germany under Hitler to increase its power, in repeated violations of the Versailles treaty. Hindsight is always 20/20, and of course we know that lack of action spelled disaster for millions around the world. But we need to avoid finger-wagging, and we need to shun the assumption that if we had only been there in the 1930’s, we would have done the right thing. If we do not attempt to understand the past, we cannot learn from it. We note first that the Versailles treaty that ended World War I was unpopular in England almost from the very beginning. Many perceived that it came down too hard on Germany. As parents, perhaps you too have known the position of being too harsh at first with your kids, and then facing the dilemma of either a) Stick to an unjust course and not back down, or b) Change your initial pronouncement and back down. Neither option satisfies, but especially if option ‘a’ would also mean hard work at keeping several countries on the same page and equally contributing, it’s easy to see why England went with option ‘b.’ They did so despite the protestations of France, who usually wanted to be harder on Germany than the British, which puts France’s 1940 collapse in a slightly different light. Ironically, we celebrate (rightly) England’s resistance to the Nazi’s in the early 1940’s and mock France for surrendering. But in the 1930’s, France in general wanted to be much tougher on Germany than England, but could never get English backing to prevent Germany’s rise to power. Secondly, for a century prior to World War I England’s basic foreign policy goal meant establishing a continental balance of power. After the Congress of Vienna in 1815, their basic theory stated that the presence of weak nations induced the stronger ones to fight over them. 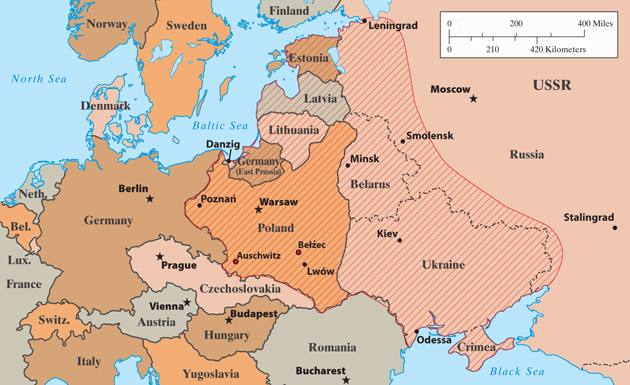 Hence, a weak Germany might tempt both France and the Soviet Union towards war over German territory. So many English statesman actually wanted a stronger Germany to balance out eastern and western Europe. England drew upon quite recent history for this, as the Austria and Russia’s mutual interest in the Balkans (see map) plunged the world into World War I. 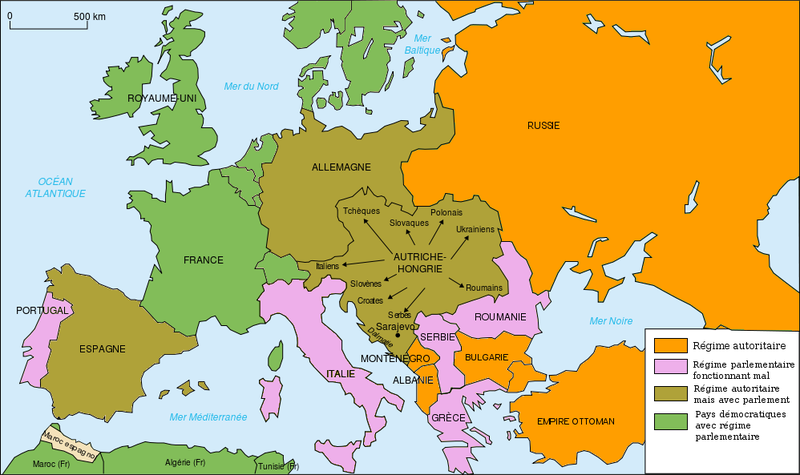 If we look at the map of Europe in 1933, we see British fears that central Europe could be a second Balkans, keeping in mind that the Soviet Union has seized the ‘slashed’ territory. We also should not forget the situation in Asia in the 1930’s. Traditionally we date the beginning of World War II in 1939, but Japan began an aggressive foreign policy in 1931 with their invasion of Manchuria. While Japan did not directly threaten anything Britain held, they began to edge closer to their crucial outposts in Singapore and Hong Kong. From Hong Kong, India stood just around the corner. British policy had to take into account the possibility of enemies in the Pacific as well as the continent, and they got almost no help from the U.S. in dealing with the Japanese in the 1930’s. 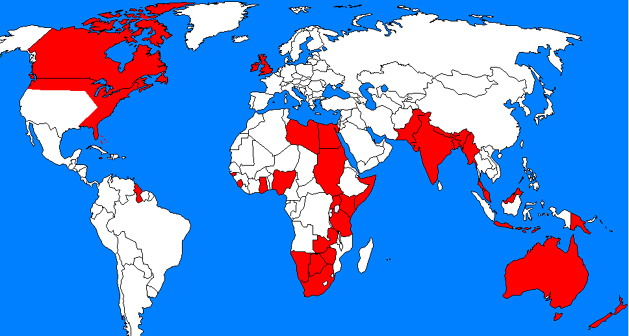 One gets a sense of this if you look at the British empire ca. 1930. Japan’s stark rise is almost as dramatic as Germany’s. They had a rich cultural heritage but almost no natural resources with which to construct a modern military. Japan looks like an aggressor in 1941, and in many ways they certainly were. But we must rewind 100 years to the treaty imposed by Admiral Perry in 1858 upon them that forced open their borders. While one can argue that forcing Japan to open up to western trade benefitted them in some ways, it was done on our terms and not theirs. The allies made the mistake of humiliating Germany in the wake of W.W. I, and both England and the U.S. made the same mistake with Japan. The humiliation continued in 1922 when England and the U.S. imposed upon Japan a treaty that forced the Japanese to have a smaller navy than either England or the U.S. Many in Japan felt that the west would only tolerate Japan remaining in an “inferior” position. Japan could have acquiesced to this inferior status, and accepted what geography gave them, or they could try and change it. The 1922 treaty proved that western powers were not going to let them do it in a peaceful way. If they wanted more power, they were going to have to take the raw materials of others, which they began to try and do in 1931 by invading Manchuria. One could argue that England was their in how to craft an empire. Finally, the economic situation needs our consideration. Prior to World War I, Germany and England traded more with each other than anyone else. Like other nations, the Depression hit England hard. A stronger Germany would mean a stronger German middle class, and a stronger middle class meant better markets for English manufactured goods. Many economists today believe, that a rising Chinese middle class will benefit our economy. Ford, I believe, sells more cars in China than they do in the U.S., for example. We have seen recently in our own time how “the economy” can dominate our own nation’s psyche. I posed this dilemma to students. . . Suppose you are a Senator whose state has a technology company that employs thousands of people, one that does hundreds of millions of dollars in business with China. Into your office comes someone from your state, who argues that because of human rights abuses and persecution of Christians in China, you should push for severe trade restrictions to try and get China to change their behavior. Would you agree with her? In class nearly every student said something like. . .
We cannot afford to lose business with China and put thousands of people out of work. China’s human rights abuses is an internal matter for China, and while unfortunate and regrettable, we really can do little to change it. Does this not sound similar, perhaps, to how nations reacted to Nazi persecution of Jews, ca. 1935? 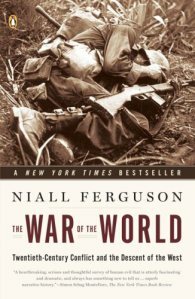 Much of what I said above I found in Niall Feguson’s book The War of the World, and especially from his chapter “Defending the Indefensible.” In fact Ferguson makes the claim that appeasement did not cause W.W. II. Rather, a war which had already began in the Pacific led to appeasement in Europe. Interestingly, though England tragically miscalculated in regards to Germany, they thought that Japan posed a more imminent danger than Germany was in one sense correct. Japan’s attack of China predated Germany’s attack on Poland by a couple of years. Neither Ferguson or I mean to exonerate England of course, but hopefully the students had a better understanding of why events transpired as they did.